Keep Your Class On Track! Day-by-day calendar is dry erasable. Fill in daily activities by the appropriate time. Perfect when you have a changing schedule. It's also a fun way to teach kids time management. 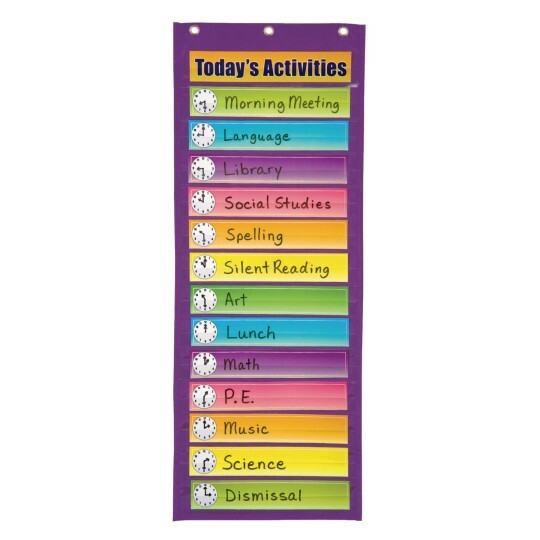 Display this Pocket Chart to help stay on track and teach time management. 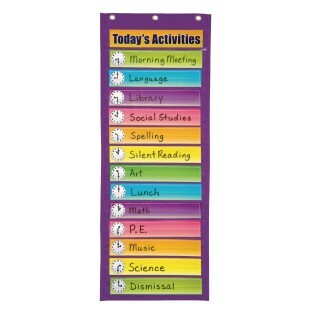 All cards are dry-erase and can be reused day after day and with every changing schedule. Includes 14 rows for displaying activities. Title card features English with Spanish translation. Features heavy-duty grommets, clear plastic pockets and durable nylon fabric. Measures 34"L x 13"W.